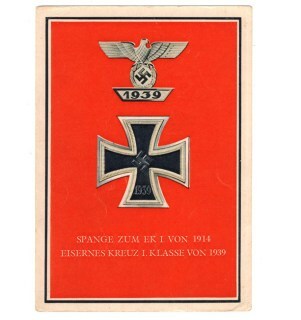 Spange 1939 to the Iron Cross 1st Class & Iron Cross 1st Class Postcard. The postcard is published by the 'Verlag C. Pahl & Co' in Hamburg. The postcard is in good unissued condition. Very nice and decorative original postcard! This is a nice original period Propaganda Postcard showing a painting of 'Der Führer' (Adolf Hitler), painted by Professor Paul Roloff. This propaganda postcard was published by the 'Verlag für Traditionspflege' in Berlin-Charlottenburg. Rare and hard to find original postcard! 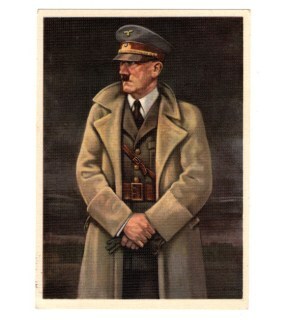 This is a nice original period Propaganda Postcard showing a painting of 'Adolf Hitler'. This propaganda postcard was published by the 'Verlag Willy Exner' in Wertheim. One corner has been folded. Nice and decorative original postcard! German Cross in Gold (Deutsches Kreuz in Gold) Postcard. The postcard is published by the 'Verlag C. Pahl & Co' in Hamburg. 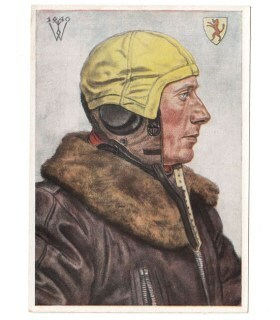 The postcard has been described on the back and was sent as a 'Feldpost' letter. Very nice and decorative original postcard! 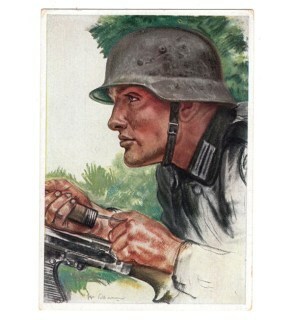 This is a nice original period Willrich postcard from the series "Unsere Panzerwaffe" showing 'Ein Panzer-Pionier'. The card is in unissued condition and is void of any writing or text. Nice and decorative original postcard in good condition! 'Tag der NSDAP im Generalgouvernement' Postcard, this event was held from 15-17 August 1941. The postcard is having a postage stamp pasted on the back and is nicely ink-stamped. Nice and decorative original postcard! 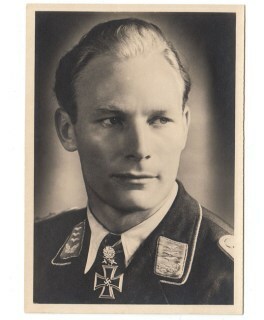 'Reichsparteitag 1939' Postcard. The 1939 Reichsparteitag was supposed to be held from 2-11 September 1939 in Nürnberg, the event was however cancelled due to the beginning of the war. The card is in good unissued condition. Very nice and decorative original postcard! This is a nice original period photo-postcard (Propaganda-Postkarte) showing Hitler's House: 'Haus Wachenfeld Obersalzberg (1000m.). This propaganda postcard was published by 'Verlag von Karl Ermisch' from Berchtesgaden. Nice and decorative original postcard! This is a nice original period photo-postcard (Propaganda-Postkarte) showing 'Des Führers Heim am Obersalzberg mit Reiteralpe' (Hitler's House). This propaganda postcard was published by 'Foto L. Ammon' in Schönau-Berchtesgaden. Nice and decorative original postcard! This is a nice original period Willrich postcard showing a 'Efolgreicher Finnischer Spähtruppführer'. The card is in unissued condition and is void of any writing or text. Nice and decorative original postcard in good condition! This is a nice original period Willrich postcard showing a 'BDM Führerin aus Kärnten'. The card was published in 1940. The card is in unissued condition and is void of any writing or text. Nice and decorative original postcard in good condition! 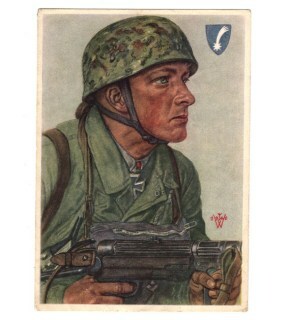 This is a nice original period Willrich postcard showing Fallschirmjäger 'Feldwebel Arpke'. The card is in unissued condition and is void of any writing or text. Nice and decorative original postcard in good condition! 'Ehrentempel "Ewige Wache" am Königsplatz' Propaganda Postcard. This propaganda postcard was published in 1936 by the 'Verlag Carl Krueck' in München. Nice and decorative original postcard! 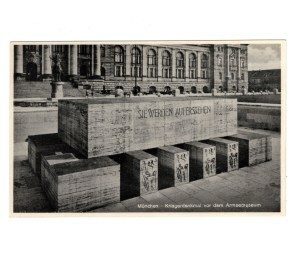 'Kriegerdenkmal vor dem Armeemuseum' Propaganda Postcard. This postcard was published in 1936 by the 'Verlag Carl Krueck' in München. The card is in good unissued condition. Nice and decorative original postcard! 'Weihnacht 1944' Postcard. The postcard is described on the back and was sent as a 'Feldpost' card on 15 December 1944 by soldier 'Hans Meyer' to his parents to wish them a Merry Christmas. Decorative original postcard! Kriegsmarine Propaganda Postcard 'Kriegsschiff schießt englischen Zerstörer in Brand'. The card is in good unissued condition. Nice and decorative original postcard! 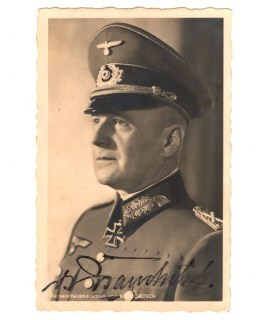 This is a nice original photo-postcard from the famous 'Hoffmann' Knight's Cross bearers (Ritterkreuzträger) series, depicting the Wehrmacht 'Generalfeldmarschall von Brauchitsch', with facsimile signature. Nice and decorative original postcard! This is a nice original period photo-postcard (Propaganda-Postkarte) showing 'Der Führer' (Adolf Hitler). This propaganda postcard was published by 'Verlag O.Stuck' in Berlin-Lichterfelde. Nice and decorative original postcard! 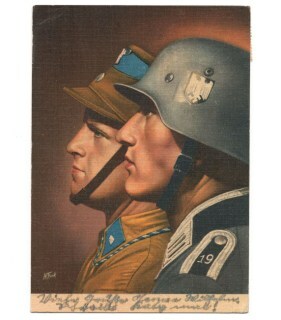 This is a nice original period 'Gebirgsjäger' Propaganda Postcard. The card is in used and sent condition, the card is described on the back and was sent on 20 September 1942. Nice and decorative original postcard in good condition! This is a nice original period photo-postcard (Propaganda-Postkarte) showing 'Adolf Hitler' with children at the 'Obersalzberg'. This propaganda postcard was published by 'Heinrich Hoffmann, Verlag nationalsozialistischer Bilder' in Berlin. Nice and decorative original postcard! This is a nice original period photo-postcard (Propaganda-Postkarte) showing 'Reichskanzler Adolf Hitler'. This propaganda postcard was published by 'Photo-Hoffmann' in München. Nice and decorative original postcard! 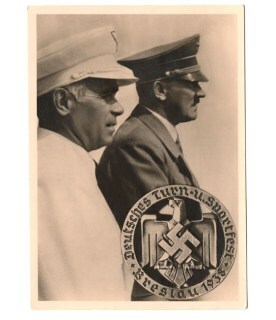 This is a nice original period photo-postcard (Propaganda-Postkarte) showing 'Reichskanzler Adolf Hitler'. This propaganda postcard was published by 'Kunst- und Verlaganstalt Martin Herpich' in München. Nice and decorative original postcard! 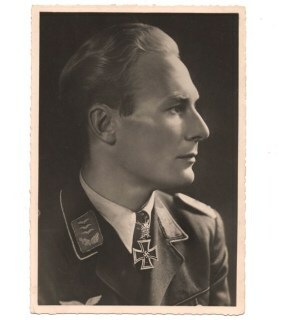 This is a nice original period photo-postcard from the famous Knight's cross bearers (Ritterkreuzträger) series, depicting the Wehrmacht 'Hauptmann Werner Baumgarten-Crusius' who was a recipient of the Knight's Cross with Oakleaves. Nice and decorative original postcard! This is a nice original period Willrich postcard showing Luftwaffe Fallschirmjäger 'Hauptmann Delica'. The card was published in October 1941. Nice and decorative original postcard in good condition! 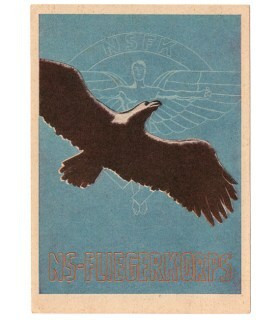 This is a nice original period 'NS-Fliegerkorps' Propaganda Postcard. The card is in unissued condition and is void of any writing or text. Nice and decorative original postcard in good condition! 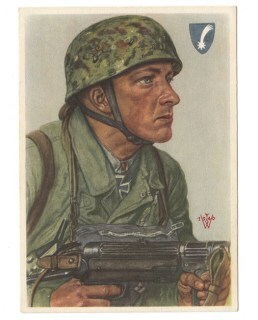 This is a nice original period Willrich postcard from the series 'Unsere Panzerwaffe' showing 'Ein Kradmelder'. 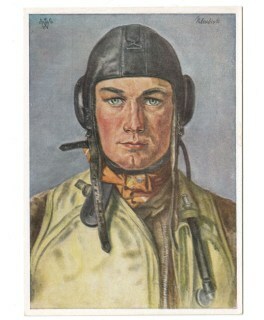 The card was published in September 1941. Nice and decorative original postcard in good condition! This is a nice original period Propaganda photo-postcard from the 'Deutsches Turn-u.Sportfest Breslau 1938', published by the 'Verlag Photo-Hoffmann'. The postcard is having 4 postage stamps pasted on the back. Nice and decorative original postcard! 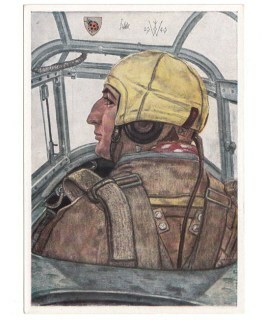 This is a nice original period Willrich postcard showing Luftwaffe Fallschirmjäger 'Oberleutnant Schmidt'. The card was published in October 1941. Nice and decorative original postcard in good condition! This is a nice original period photo-postcard from the famous 'Hoffmann' Knight's cross bearers (Ritterkreuzträger) series, depicting the Luftwaffe 'Major Baumbach'. Nice and decorative original postcard! This is a very nice and decorative original Winterhilfswerk Postcard showing three 'Frontflugspangen'. 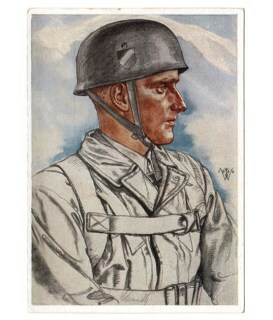 Sent by a soldier within the 'Panzerjäger-Ersatz-Abteilung 10'. 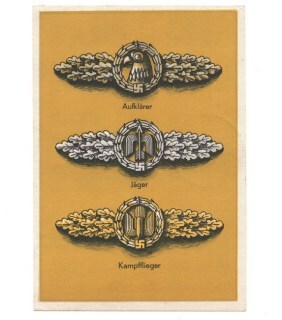 Decorative original Postcard, great to display with some Luftwaffe clasps! 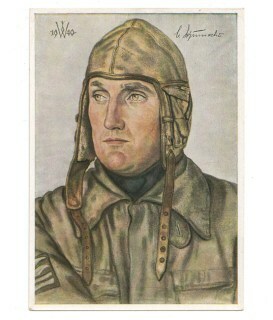 This is a nice original period Willrich postcard showing a Luftwaffe 'Aufklärungsflieger'. The card is in unissued condition and is void of any writing or text. Nice and decorative original postcard in good condition! This is a nice original period Willrich postcard showing the Wehrmacht 'Oberst Rothenburg, Bewährter Führer eines Panzerregiments'. The card is in unissued condition and is void of any writing or text. Nice and decorative original postcard in good condition! 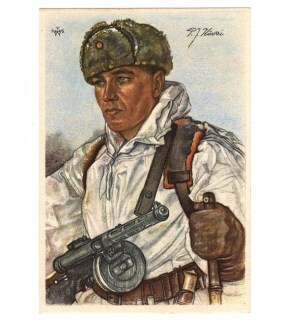 This is a nice original period Willrich postcard showing a Wehrmacht 'Kradmelder, einer Panzer-Vorausabteilung'. The card is in unissued condition and is void of any writing or text. Nice and decorative original postcard in good condition! 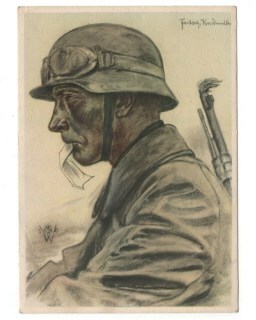 SA and Wehrmacht (Heer) Propaganda Postcard (Postkarte). The postcard is in used and sent condition. There has been written on the back. Decorative original postcard in good used condition! 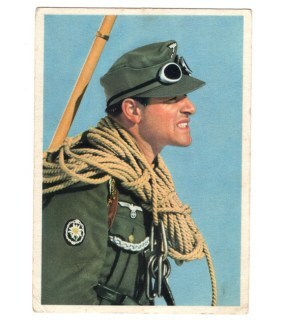 This is a nice original period photo-postcard from the famous 'Hoffmann' Knight's cross bearers (Ritterkreuzträger) series, depicting the Wehrmacht 'General der Gebirgstruppen Dietl'. Nice and decorative original postcard! 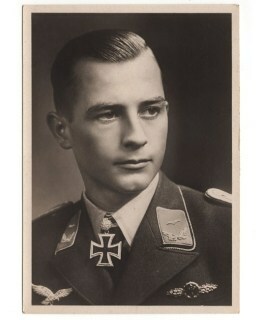 This is a nice original period photo-postcard from the famous 'Hoffmann' Knight's cross bearers (Ritterkreuzträger) series, depicting the Luftwaffe 'Leutnant Hans Strelow'. Nice and decorative original postcard! This is a nice original period photo-postcard from the famous Knight's cross bearers (Ritterkreuzträger) series, depicting the Wehrmacht 'Generalfeldmarschall von Brauchitsch'. Nice and decorative original postcard! This is a nice original period photo-postcard from the famous 'Hoffmann' Knight's cross bearers (Ritterkreuzträger) series, depicting the Luftwaffe 'Hauptmann Helbig'. Nice and decorative original postcard! This is a nice original period photo-postcard from the famous 'Hoffmann' Knight's cross bearers (Ritterkreuzträger) series, depicting the Luftwaffe 'Hauptmann Baumbach'. Nice and decorative original postcard! This is a nice original period photo-postcard from the famous 'Hoffmann' Knight's cross bearers (Ritterkreuzträger) series, depicting the Luftwaffe 'Oberleutnant Beisswenger'. Nice and decorative original postcard! This is a nice original period Willrich postcard showing 'Major Wick, Kommodore eines Jagdgeschwaders'. The card is in unissued condition and is void of any writing or text. Nice and decorative original postcard in good condition! 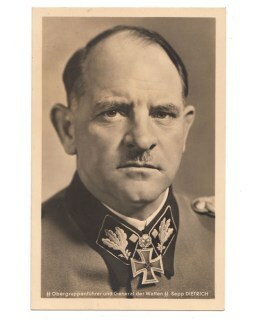 This is a nice original period Willrich postcard showing 'Hauptmann Falck, Staffelkapitän einer erfolgreichen Jagdstaffel'. The card is in unissued condition and is void of any writing or text. Nice and decorative original postcard in good condition! 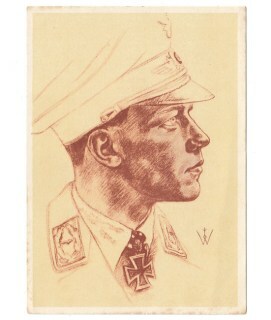 This is a nice original period Willrich postcard showing 'Oberleutnant Steinhoff, Staffelkapitän einer Jagdstaffel'. The card is in unissued condition and is void of any writing or text. Nice and decorative original postcard in good condition! 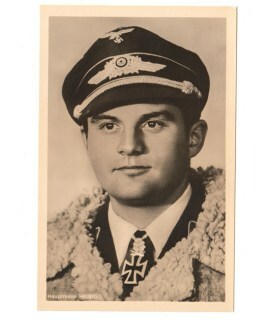 This is a nice original period photo-postcard from the famous 'Hoffmann' Knight's cross bearers (Ritterkreuzträger) series, depicting the (Waffen-SS) 'SS-Obergruppenführer Sepp Dietrich'. The card is in good unissued condition. Hard to find original example! 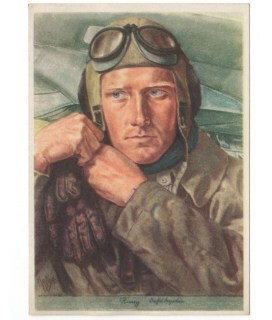 This is a nice original period Willrich postcard showing a 'Jagdflieger' (Fighter Pilot). The card is in unissued condition and is void of any writing or text. Nice and decorative original postcard in good condition! This is a nice original period photo-postcard showing the Luftwaffe Knight's cross wearer (Ritterkreuzträger) 'Major Oesau'. This propaganda postcard was published by the 'Film Foto Verlag' in Berlin. Nice and decorative original postcard! 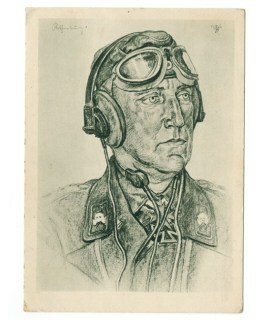 This is a nice original period Willrich postcard showing Oberstleutnant 'Schumacher', commander of a 'Jagdgeschader'. Nice and decorative original postcard in good unissued condition!